A friend showed up last weekend with his magic pie plate (a housewarming gift: it comes prefilled with a pie, and magically refills whenever you visit. AMAZING!) and asked for a strawberry-rhubarb pie. He even provided the rhubarb. Which, by the way, is also called pie plant. Just so you know. Because I called the post ‘pie plant pie’, see, and I was afraid that maybe somebody would think I was just on drugs or something. Ahem. Anyway. Moving on. Look! It’s rhubarb and strawberries! 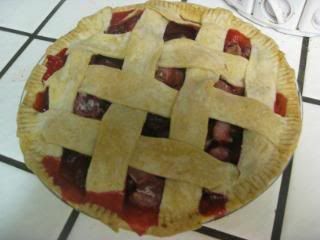 Strawberry-rhubarb pie is great on a couple of fronts. It’s super easy to put together, with no advanced slicing or mixing skills needed or ingredients you’ve never heard of required. It tastes mostly like strawberry, which can make it a gentle introduction to rhubarb – rhubarb is a pretty tart-bitter flavor on its own, and not everybody loves it. It uses about half the sugar of a straight-rhubarb pie, AND is utterly without animal products. Nice when you’re cooking for a mixed crowd that contains vegetarians and/or vegans. 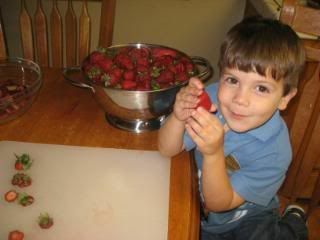 The biggest drawback is that you tend to have a lot of helpers appear when you’re trying to slice strawberries. 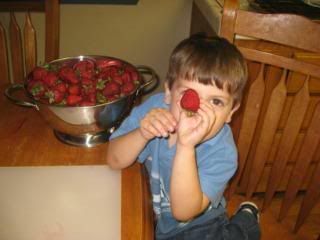 Sooooooo, you’re saying…you want to use THIS strawberry? This one? You’re sure? An oven preheated to 375. A word from the School of Hard Knocks graduate over here: Put something down in the oven to catch the juice before you heat it up. Fewer burns that way, and you will thank yourself for foresight later. These babies tend to bubble over like crazy in there. That’s it. Told you it was simple. 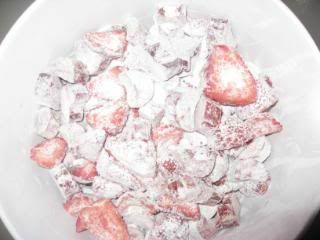 Mix the dry ingredients together, and toss with your sliced rhubarb and strawberries. It’s like snow in July! 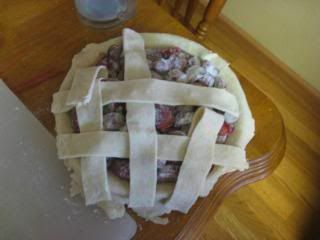 Now, rhubarb-strawberry pies are frequently topped with a lattice rather than a straight crust. They’re great candidates for it, because they are soooooo juicy that not being sealed tight doesn’t hurt their moist-factor one bit. But lattices often seem to freak people out. They think they’re hard and stuff. Nah. Not hard. Check it out. You roll out your bottom crust, put it in the pan and add the filling. Then, roll out the top crust, just like you usually would. You don’t need to be too fussy about perfect roundness, though, because next you’re going to square it off and cut it into strips. Wait…does this mean my blog is now a strip show?! Weaving the lattice is really easy. Over and under, just like making a potholder at summer camp. I generally put the three “upright” pillars in first, then fold them back and weave the horizontal ones in. I finished this one with a quick fork-crimp around the edge. Dip the fork in some flour and just press the tines into the crust all the way around. Fast, attractive, and easy. Now, there’s another ‘open top crust’ technique called the quick lattice or cutout lattice. I kind of like this one because of the high amusement factor. For this one, I chose dragonflies. 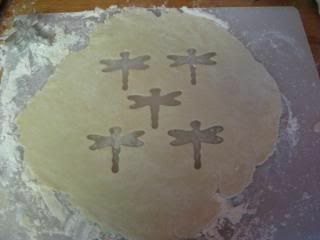 This is the top crust, with dragonfly cookie cutter poised for action. There are a few ways to go about the cutout technique. Depending on the size and shape of the cutter you use, you might do the whole entire top, all over (a small oval cutter, for example, looks neat with a tight series of holes). Mine being somewhat large, I chose to do just a few cutouts, centered. Does this not make you think of a squadron of dragonflies? One of the fun things about using the cutout technique is that you can then further decorate with the cutouts. 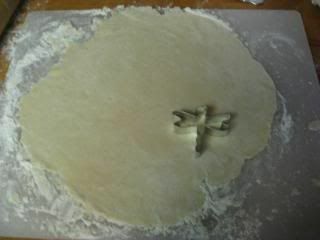 Brush the top of the pie and the bottom of the cutout with a little water, and it’ll adhere like it was glued. Hee. 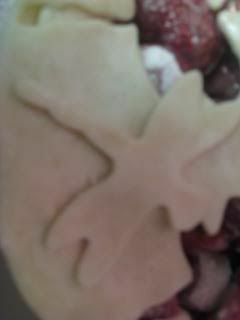 There’s a bug on my pie, and people think it’s cute! I left the edges kind of “au natural” on this one. Trimmed to about 1/2”, tucked the top one under the bottom one and gave it a quick pinch all the way around to seal it. Very “rustic” looking. Brush the top with your glaze of choice (just water, just milk, sugar-water, water with an egg white stirred into it) and sprinkle with sugar or cinnamon-sugar if you like. Remember to avoid the crusts, and make sure you don’t have any glaze pooling up on the surface – it’ll cause those areas to get too brown too fast. Cover the edges with tin foil to prevent premature browning (blackening), bake at 375 for 25 minutes, take off the foil and bake another 20-30 minutes or until the crust is properly browned and the juices are bubbling. See what I mean about the juice? Right over the edge!! I didn’t take any pictures of this because I wasn’t thinking about it at the time, but there’s almost always a little crust dough left over when you make a pie – and when you make a lattice, there’s even more. You can wrap leftover dough scraps in plastic wrap and put them in the freezer. I don’t personally like to do that because I feel that it makes for a fairly tough crust. But I’m picky about pie crusts. Really, really picky. So what I do is either use it right then for a pot pie, using whatever casserole is in the fridge (there’s usually at least one Tupperware in there with leftover casserole in it), or I make crackers. Roll out the leftovers and cut it into shapes. 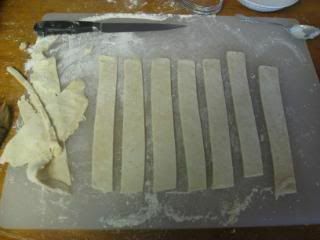 You don’t have to be fancy, although using a cookie cutter makes for a nice end product. Put them on a cookie sheet, brush with milk, melted butter or cream (water works fine too, it just doesn’t add as much flavor), and sprinkle with the seasoning of your choice. Onion or garlic salt make good savory snacks, cinnamon sugar is always popular…cheese and pepper…use your imagination. Bake in that 375 oven for, eh, between seven and twelve minutes depending on your topping. Until they’re nice and brown. It makes a nice cracker and helps keep the guilt of throwing away extra dough at bay. Strawberry rhubarb pie... YUM! Brings back lots of memories. And I love the dragonfly pie crust... cool. I never make lattice top pies thinking ‘they’re all that work’. This thought comes from my mother’s technique, undoubtedly straight out of her 1950s Betty Crocker Cookbook, which used like two dozen skinny little strips of pie dough woven together. Pretty, but who has time or patience. I could be knitting after all. But you’re method - sheer genius! Seven nice fat strips which probably don’t take much more time to get in place than a normal top crust. This I must try immediately. Thanks. Your recent posts are not at all helpful to my weight-loss efforts. Just sayin'. I grew up with brown sugar pies made from the leftover dough. It is a hand me down tradition from my Great Grandmother, to Grandmother, to my Mom, then to me. My son insists on it and I hope he'll learn to make it some day. Roll out dough to round, put brown sugar on one half, (amount depends on the size of the dough) fold over, crimp, a couple of holes poke in on top, egg wash on top and bake until golden brown. 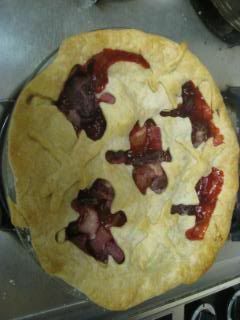 I am not a big fan of strawberry-rhubarb, but just looking at that beautiful pie makes me change my mind. Love that magic pie plate bit! I might have to do my own take on the idea with a cookie jar or something. So cool! 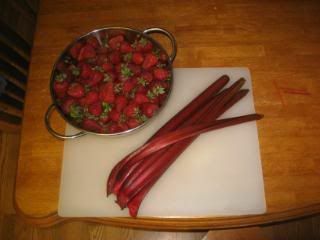 I LOVE strawberry rhubarb pie, it's not called pie plant for nuthin' ! My Grandfather was the piemaker in my family, he would roll out the pie crust scraps - add a spoonfull of jelly and fold it into a little tart. They were allways waiting for a Grandchild's vist. Try them with your kids. You solved the mystery of pie plant for me! I had always wondered what it was after reading the Laura Ingalls Wilder story where she was cooking for the hired men and forgot to put sugar in the pie plant pie. Now that I realize she made rhubarb pie without sugar, I understand her embarassment!